Ahhh…. That glorious “Aha moment”! The Aha Moment is a hope and joy for every coaching leader, and truly for every person being coached! The Aha Moment brings clarity, hope and vision that were not there before it happened. The Aha Moment is the first step in getting unstuck. So, how do we get there? 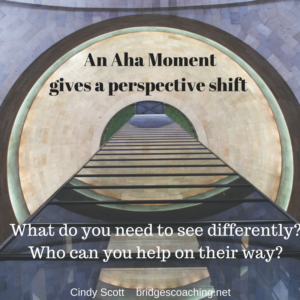 How can we facilitate an Aha Moment?! The best thing we can do as coaches is to provide a safe place for processing. This opens the door of opportunity for two things to happen. 1) The person being coached gets the floor.